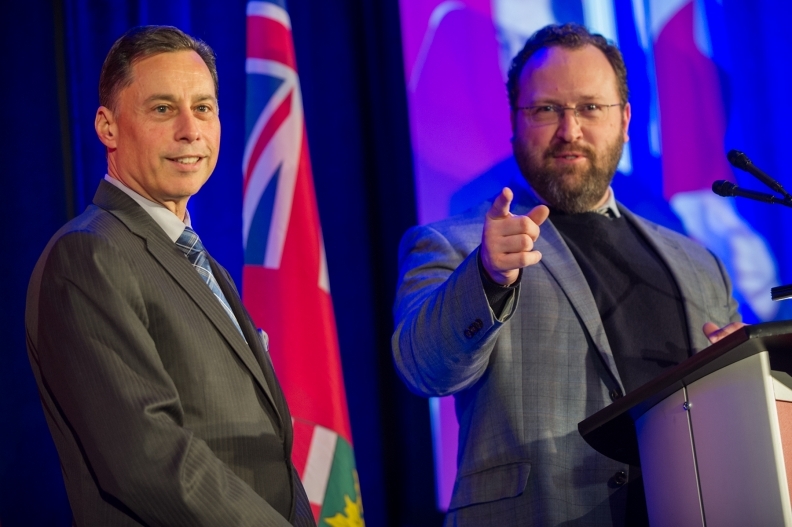 Automotive Parts Manufacturers' Association President Flavio Volpe, right, met with Ontario Minister of Economic Development Brad Duguid to talk about labour laws. Canadian auto parts makers don’t believe proposed changes to Ontario’s labour laws will negatively their industry as much as they originally thought. The province officially announced new legislation Tuesday from Premier Kathleen Wynne’s office in Toronto. The changes were borne out of the Ministry of Labour’s nearly 400-page Changing Workplaces Review document, which included proposed revisions to minimum wage, the union certification process and how temporary workers are treated. All three affect the auto parts sector. The document went to cabinet just last week and ministers toned down the report’s proposals over the last few days. Wynne’s Liberals will now table the final proposals at Queen’s Park. Even though they must still be voted on, changes are expected to pass since the Liberals enjoy a majority government in the Legislature. Equal pay for temporary workers doing the same job as full-time employees. Automotive Parts Manufacturers’ Association President Flavio Volpe and his members feared much worse for their industry. “I think materially, it’s better than the report that was out last week,” Volpe said shortly after the announcement Tuesday. The Ministry of Labour’s report originally would have allowed union certification in all industries through the total number of signed cards obtained rather than through a secret-ballot vote, which is currently law. Volpe previously said an easier union certification process would make Ontario less competitive against right-to-work states in the United States. Wynne said Tuesday card-based certification will only apply to temporary workers, building services workers and community care workers. What is immediately known is that pensions and benefits won’t be mandatory for temporary workers. As for minimum wage, it will affect a supplier’s bottom line and hiring practices, Volpe warned. Volpe said his industry already pays more than the current minimum wage of $11.40/hr — between $15 and $17 an hour, he said — and that raising the general minimum wage “shallows the pool of available workers for us” because other sectors suddenly become more attractive.Volpe said the auto industry might, in turn, have to raise its starting wages to remain attractive. It might also discourage people from accepting an auto job that requires shift work, for example. “We understand why they went where they went on minimum wage. I don’t know how you live in Toronto on $11.40 an hour, so I get it,” he said of the current minimum wage. But Volpe called the new legislation a “really blunt instrument” that causes problems for the parts makers. Volpe wasn't specific about what types of offsets the auto sector might want. He hopes to have a chance to speak with the minister of labour before the law is passed. The increase to minimum wage would be phased in over the next 18 months, rising to $14 an hour on Jan. 1, 2018, and then to $15 on Jan. 1, 2019. “We’d hoped for a longer phase-in period,” Volpe said. Volpe is also upset neither he or his members got to meet with Minister of Labour Kevin Flynn during the writing of his report. Volpe did meet with members of the premier’s office and the minister of economic development. All workers would be given 10 personal emergency leave days a year, and a minimum of two of those days must be paid. "People are working longer, jobs are less secure, benefits are harder to come by and protections are fewer and fewer," Wynne said. "In a time of change like this, when the very nature of work is being transformed, we need to make certain that our workers are treated fairly." It’s not yet know when the new legislation will be voted on.